From Troy: Take Hwy 61 South to Moscow Mills Hwy C exit - Turn R off ramp - Turn R on Elm Tree Rd - Turn L at Whitetail Crossing Subdivision entrance (Whitetail Crossing Drive) - Turn R on Turkey Call Ct - home on left. Hello, I’m interested in 552 Turkey Call Court and would like to take a look around. The details on 552 Turkey Call Court: This house located in Troy, MO 63379 is currently pending sale for $205,000. 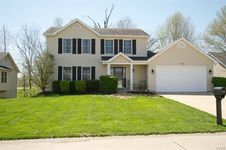 552 Turkey Call Court is a 1,652 square foot house with 3 beds and 4 baths that has been on Estately for 8 days. This house is in the attendance area of Ninth Grade Center, Troy South Middle School, Troy Buchanan High School, and Claude Brown Elementary. Listing Courtesy of: MARIS and Berkshire Hathaway HomeServices Select Properties.